Cleaning: In most cases, when a dentist talks about a cleaning, he is referring to teeth polishing. This is performed by using a low speed handpiece with an attached plastic prophylactic cup or brush, which are rotated at a certain speed and rubbed against your teeth with a sandy, non-toxic, paste. This procedure is normally used in children or patients with excellent tartar control since it does not remove tartar but only plaque. It helps to remove superficial stains and yellow tones off your teeth and bring back its former glory. Periodontal Maintenance: This is a thorough cleaning of your teeth which removes subgingival and supragingival tartar, as well as dental plaque and stains, all in the same procedure. Initially we begin by using an Ultrasonic Scaler to remover larger size calculus from your teeth. 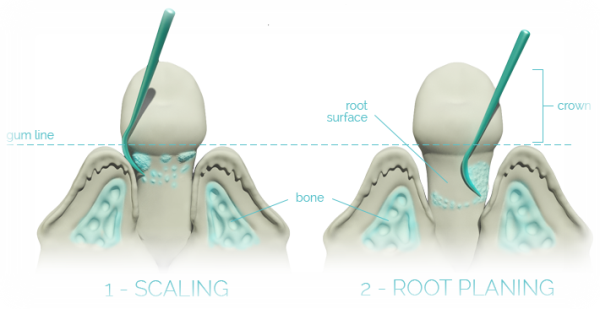 After this, we use Curettes to remove remaining smaller pieces of calculus and to smoothen the surface of your teeth's roots, this helps to difficult calculus formation and remove dangerous bacteria. Last but not least, we perform a teeth polishing, helping us to remove plaque, stains, yellow dye on your teeth and acquiring a smoother surface. It is important to clear out that Periodontal Disease is not reversible by any matter. But, by performing a Periodontal Maintenance every three to four months, the destructive progress of the Periodontal Disease can be halted.